The frog Hyla sanchiangensis from eastern China is a descendant of one of three lineages that made it through Earth's last mass extinction 66 million years ago to flourish worldwide today. The asteroid that hit Earth 66 million years ago spelled disaster for the dinosaurs. But scientists say they've found one silver lining to the mass extinction — turns out, it was really good for frogs. The resilient animals date back some 200 million years. And in the aftermath of the extinction event, they survived and thrived, taking advantage of an ecological vacuum other animals left behind. About 9 in 10 frog species today evolved from three frog lineages that survived the event, which occurred at the boundary between the Cretaceous and Paleogene periods, according to research published Monday in Proceedings of the National Academy of Science. The timing of this rapid diversification came as a surprise, University of California, Berkeley herpetologist and report co-author David Wake tells The Two-Way. It's about 35 million years later than previous research suggested. As the Chinese and American researchers noted in a press release, the previous estimate was puzzling, "since Earth's environment was stable at that time. A changing environment typically drives evolution." They say that "analysis of molecular evolution in mitochondrial DNA [like in previous studies] often produces dates for lineage divergence that are too old." The new research focuses on nuclear genes instead, which Wake says can provide a "much clearer picture of what's happening." Frogs are "master survivors," Wake says, able to go underground and live through long periods of inactivity. The scientists aren't sure why three main lineages ultimately outperformed all the others that were living at at the time of the asteroid strike. There continue to be remnants of other pre-asteroid lineages around the world, the scientists say, and they're "just as diverse today in their habitats and breeding strategies" as those descended from the three dominant lineages. But the primary ancestors of today's frogs seized the ecological opportunity after mass extinction, explosively evolving new species. "It's these three lineages that were at the right place and the right time and they just took off like crazy," Wake says, adding that they also "rapidly increased in their use of habitats and their use of resources." At the same time, seed-bearing trees and other flowering plants suddenly dominated the landscape. All three of the frog lineages contain species that started to dwell in trees, which was not previously seen in frogs. It was a sign, Wake says, of frogs "experimenting with new ways of life." Many of the new frog species also started to lay their eggs on land, skipping the tadpole phase and growing directly into a small frog. There are currently about 6,775 known frog species, and Wake says this trait is now found in about half of them. 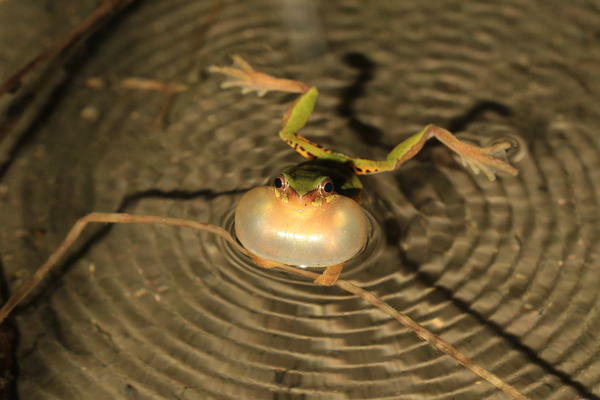 What this research shows, Wake says, is that frogs have the proven ability to "[take] advantage of opportunities — in this case [an] ecological vacuum that existed following the mass extinction." Now, the scientists want to study what it was about these lineages that allowed them to perform so much better than the others that survived the extinction event.